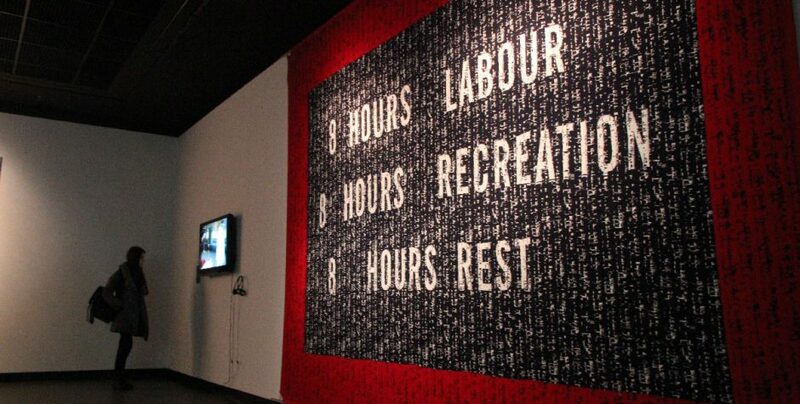 Reinterpreting the heritage of NW textile industry, whilst documenting the current reality of the ‘work’, Punchcard Economy is a machine-knitted banner based on the ‘8 hours labour, 8 hours recreation, 8 hours rest’ slogan coined by Robert Owens of the Eight Hour Day movement. The design incorporates data collected from a range of ‘workers’ in the digital, creative and cultural industries. The final work is produced on a domestic knitting machine using a combination of digital imaging tools and traditional punchcard systems.